Grow Home is an adorably frustrating game created by Ubisoft that focuses on a robot’s mission to explore a planet and get back to its ship. Players assume the role of B.U.D (Botanical Utility Droid) who takes on the mission of re-oxygenating his home world. To do this, B.U.D must grow a giant star plant and take one of its seeds. How does one grow a star plant? By fumbling around the environment, falling over yourself, growing plants towards glowing energy rocks in order to make the main stem grow and fall a bunch of times, it turns out. But I digress. Grow Home has a lot of great promise in its strange mechanics and quirky style, but those positives sometimes get weighed down by issues created from its mechanics in the first place. The art style of Grow Home is the first thing players will notice as it pops off the screen with bright colors, sharp angles, and an interesting take on vegetation. The world B.U.D explores is clearly alien, with strange plants scattered around the open world and somewhat familiar creatures roaming the land. Grow Home has a very unique art style that is certainly one of its strong suits. I would often take a moment to look around and appreciate the scenery as I grew my star plant higher towards the heavens. In fact, for a game that is so small in terms of world size, Grow Home has a phenomenal sense of scale as you climb higher and higher towards the stars. But first, you fall a long way down. After falling from his ship to the world below, B.U.D gets up and starts walking around, and that’s where some issues start. B.U.D is a strange character, both in his quirkiness and design. You see, B.U.D follows both procedural animation and the laws of physics. This means that as he walks around he can get tripped up on corners, barrel into objects, and slip and fall off of ledges rather easily. In fact, during my playthrough I had the pleasure of getting B.U.D’s head caught under a leaf and then watching as his body tried to act accordingly by flopping around until the two were reunited when B.U.D’s body passed over a gap in the leaf. I understand this animation style was used to make B.U.D appear adorable and quirky, and it does, but having if affect the gameplay is just unfortunate. While these strange animation moments are rare, at least in my experience, they do become a nuisance, especially when they screw up a good run. Grow Home is a fairly simple game when it comes to gameplay mechanics. B.U.D is able to walk around, albeit awkwardly, jump a bit, though that can be challenging as well, and climb. Climbing and grabbing onto things in the world are the main mechanics in Grow Home. 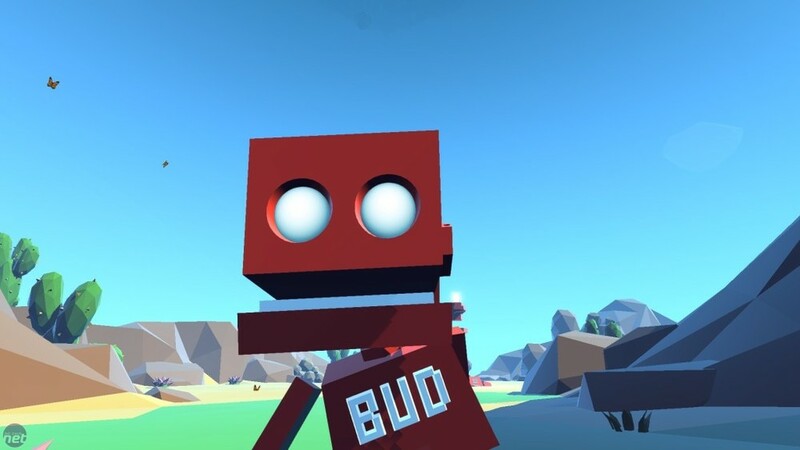 Using the two trigger buttons, one for each of the robot’s hands, you use momentum to swing B.U.D around and climb up tall structures. As you climb up the main structure of the game, the star tree, you encounter smaller stalks with red flowers protruding from their tops. These can be gripped and ridden like a bucking bronco as you try to aim them towards glowing rocks in order to grow the star plant more. While the first two or three times you do this movement feel exciting, the action becomes repetitive quickly. Soon enough you’re climbing up the star plant, growing stalks to hit rocks, missing the rock because your stalk doesn’t grow far enough, and growing another stalk off of the one you just grew to finally hit the rock. There isn’t much in terms of strategy or different objectives but at least the climbing is fun, occasionally. For a game that focuses solely on climbing around to get from place to place you would hope the climbing mechanics are top notch. Well, just because this is an Ubisoft game don’t go expecting Assassin’s Creed climbing. As mentioned before, the climbing works with each trigger controlling one of B.U.D’s hands. This leads to an some moments where you feel like a pro as you somehow manage to hang on at the last moment before falling to your doom and other moments where you fall seemingly out of nowhere like you’re playing Mount Your Friends. Those first few times you fall are funny but when you start to climb higher the repetition of climbing, falling, respawning and having to climb again gets tedious. There’s a lot to like in Grow Home despite its short length. Sure, for those that want to see everything and collect all the crystals (there are 100), it can be a longer game. But for people looking to play through the main story and see what the game has to offer, all of that can be done in three to four hours tops. The quirkiness of B.U.D and the beautiful art, along with the great sense of scale are really appealing features to this neat game that feels like it came from an indie studio and not a behemoth like Ubisoft. In fact, Ubisoft is at its best when it thinks outside the box and creates strange things like Grow Home. Unfortunately, the short length and frustrating moments that feel unwarranted and unexpected do a lot to hurt what could’ve been a fun and quirky platformer. Grow Home is worth checking out if you’re looking for an interesting romp through a beautiful world with new mechanics in terms of platforming, just be ready to fall to your death and not understand why. The experience of Grow Home is interesting, but not one that it overwhelmingly positive. The use of procedural animation and rag doll physics for a protagonist may pay off some day down the road once the idea has been refined. In this game, however, it usually just gets in the way of what is otherwise a charming and colorful platformer. This series’s defining trait is, unfortunately, its biggest problem.